Life, cooking — really everything — is a series of choices made and paths left unwalked, but the thought of those alternate lives or experiences never hangs lower to my consciousness than in fall. I am beginning to reach the age when the glow of living a life where All Things Are Possible starts to fade. Fall reminds me of this far more than winter. Winter for me is a season of survival. Get through it. Take stock of what you have. Make hopeful plans for the future. Fall is when the reckoning comes for those winter-made plans. What does all this have to do with a simple tomato paste? Everything, really. Call it tomato conserva, estratto, estrattu, ‘strattu or just tomato paste, this simple ingredient anchors my cooking all winter long. It is as important to me as olive oil, beer or my morning coffee. All ‘strattu is is tomatoes and salt. And time. I don’t normally make my tomato paste in September. My version is Sicilian, and it’s called ‘strattu. 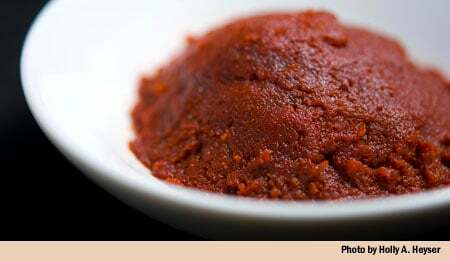 This is something different from typical tomato paste, something much older. Something that needs the scorching summers of Sacramento or a place like it. I normally make it in shallow cookie sheets in July or August, when temperatures soar well past 100°F. Sicilians put their tomato paste on their roof. I put mine in the bed of my pickup. In a good stretch of summer, I can make ‘strattu in 3 or 4 days, taking the paste in every night. If the weather cools below 95°F, however, the process can take almost a week. 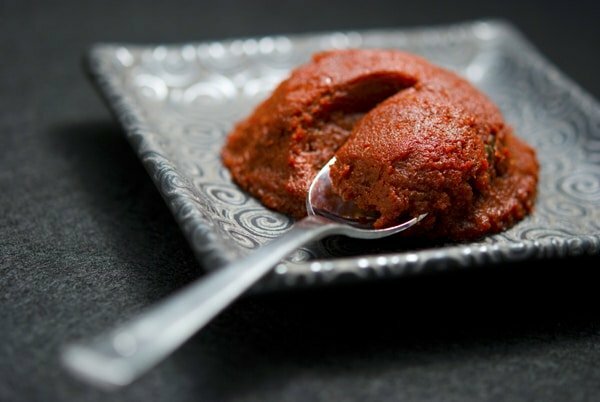 Two things make this tomato paste different from typical conserva: Long periods under the hard ultraviolet glare of the sun, and low “cooking” temperatures. The tomatoes never even come close to a boil, which in theory preserves that fresh tomato flavor — only the UV light wreaks havoc on the lycopene and the unsaturated fatty acids that help create that flavor, according to the reigning King of Food Science, Harold McGee. The result looks like a block of tomato clay. ‘Strattu is a magical ingredient, a thousand times better than any tomato paste you can buy in the store. Think of it as the black hole of the tomato world: It is said that a teaspoon of black hole matter would weigh millions of tons. Similarly, a mere teaspoon of ‘strattu in a soup is the equivalent of adding possibly a dozen tomatoes. Traditional tomato paste is a bantamweight next to this heavy hitter. You start with at least 20 pounds of Roma or other paste tomatoes. Yes, I said 20 pounds. Cut the tomatoes into chunks. I cut each tomato in half lengthwise and then cut crosswise 2 to 4 times, depending on the size of the tomato. 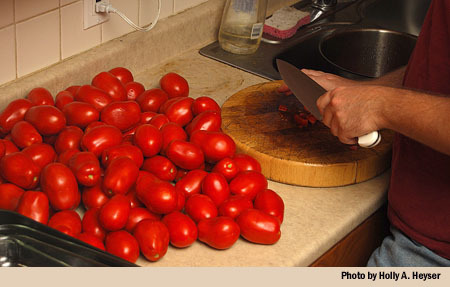 Toss the tomatoes with some salt and put them into the largest stockpot you own. You may need to use several, or do this in batches. A word on the tomatoes themselves. You must use paste tomatoes, or the starting sauce will be too watery. What kind of paste tomatoes? I buy the ubiquitous Romas that are cheap and good here at California farmer’s markets. I buy from a vendor who grows them well, so that nine out of 10 tomatoes are fully red inside. This is key. If you need to buy from a supermarket, buy them several days to a week before you want to make ‘strattu, and let the tomatoes ripen at room temperature. Under no circumstances should uncooked tomatoes be refrigerated. Ever. Cold turns their sugars to starch and you’ll be left with a nasty, mealy tomato. Once all of your tomatoes have been chopped and lightly salted, cook them over high heat, stirring often, until enough of the tomatoes, give off enough liquid to come halfway up the pot. With my stockpot it takes no more than 10 minutes. This next step is important: Turn off the heat and cover the pot. You want to steam the tomatoes for about 30 minutes, so they soften enough to push through a food mill. Once your tomatoes are soft, push all of them through a food mill with its finest plate. You want no seeds in the sauce. If you don’t have a food mill, you need one — or something that will remove skins and seeds and crush the tomatoes. The old Sicilians would plunge the tomatoes into boiling water, then shock them in cool water to remove the skins. They would then chop the tomatoes by hand, manually removing the seeds. Hard work. Even with a food mill this is a workout. I was sweating by the time I milled the 25 pounds of tomatoes I was working with, and it was not from the heat of the day. Yep. Tomato leaves. For 25 pounds of tomatoes, choose 10 sprigs from your healthiest plants. And no, tomato leaves are not overly toxic. Bertolli uses them in his sauces, McGee has analyzed their toxicity here, and I know some old nonnas in Jersey who’ve sworn by them since they left the Old Country. 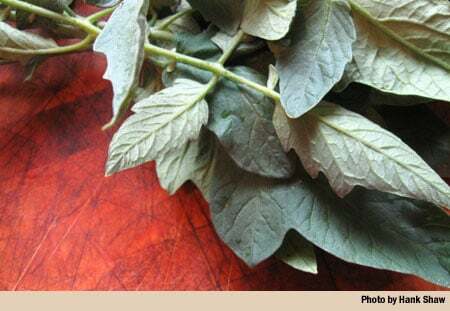 Tomato leaves boost the fresh tomato flavor in your sauces, including ‘strattu. Close the doors on the oven and walk away. Time is your only obstacle to ‘strattu now. Every few hours go in and stir the sauce. It should never simmer. After about 5 hours, drop the heat to 200°F. Keep moving the sauce toward one container as the water evaporates. I try to get it all into my roasting pan by nightfall. Once the tomatoes get tighter than a typical pasta sauce, pull out the tomato leaves. It’s OK if one or two leaves are stuck in the mix, but be sure to get all the stems out. After that first day, meaning about 12 hours in the oven, turn the heat off and let the tomatoes sit in the oven overnight. They’ll be OK. Trust me. The second day, turn the oven to 200°F or put the tray out in the hot sun. Now you will need to stir every hour for another 6 to 8 hours. You will have conserva by morning, and it is this second day that turns conserva to ‘strattu. Toward the end of the second day, the paste will darken and will need to be folded over itself every 30 minutes or so. You know you are done when you can pick up the paste and knead it like clay. It will be brick red. What now? Coat the ‘strattu in a thin layer of olive oil, then coat the inside of a half-pint jar with olive oil. Working carefully, press the ‘strattu into the jar making sure there are no air pockets. Use a butter knife to help pack the paste in the jars — and the flatten it out once it is inside. Top with 1/2 inch of olive oil. It will keep for 6-8 months in the pantry, but if this worries you, lower the covering of olive oil to 1/4 inch and keep the ‘strattu in the fridge. As you use it, be sure the ‘strattu stays covered in olive oil, and scrape off any mold that develops early; if black mold appears, toss it out. It’s happened to me once over the years, so black mold is not common. Finding a way to make ‘strattu when it was raining felt like snatching one of those missed opportunities back from the bin. It also forced me to slow down this past weekend, something I have a hard time doing but needed very much. Now as I head into another autumn, I have four pints of the magic paste — more than enough to get me through a winter of long braises and slow-simmered stews. One less regret, one more comforting row on the pantry shelf. I noted you quote a source that says UV light wrecks havoc on lycopene. Lycopene is real good for men’s health in particular as it is known (from a peer-reviewed scientific source) to reduce PSA (prostate specific antigen) level. I don’t think we know if this also means it could help prevent prostate cancer (though maybe it does) but it would still be a good thing if it just reduces PSA level. Since many/most of your readers are male, this could be quite an important message. (You can do a quick GOOGLE check on literature source for lycopene and PSA to confirm).